We have your first song from Rani Mukerji’s Hichki – ‘Oye Hichki’. A very catchy song, it also has a very inspiring mesage – the video sees Rani call out the prevalent social Hichkis like preference for fair skin, looking down at people with disabilities, girls not having the right to choose their life partners, play sports and more etc. This video highlights the different types of discriminations prevalent in our society today and song urges everyone to identify them and overcome them, one discrimination at a time. Celebrate the Hichkis! What is really cool is that Rani launched the song at her school Maneckji Cooper this afternoon. Rani plays the character of Naina Mathur who has a nervous system disorder, Tourette Syndrome that forces an individual to make involuntary repetitive movements or sounds. Hichki focuses on turning disadvantages into opportunities and staring down at challenges that life throws at one and ultimately winning over them. It is also a subtle reminder about discrimination that exists in our society and has become a part of our daily lives. It highlights this through the story of Naina, who faces discrimination from our society that firmly believes she cannot be a teacher because of her disorder. 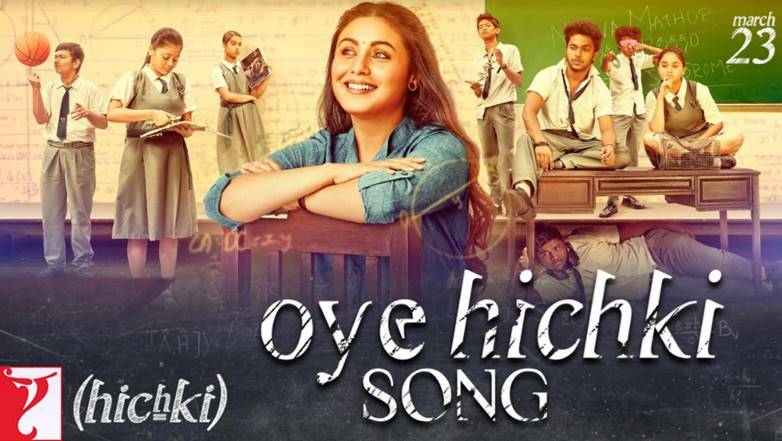 Sung by Harshdeep Kaur, music by Jasleen Royal and lyrics by Jaideep Sahni, the catchy Oye Hichki song is choreographed by none other than Vaibhavi Merchant.